The staff at the Humane Society of Missouri say Benjamin is a favorite dog of theirs and when you watch his adoption video, you'll see why. He's adorable. Tail wagging, a grin on his face, and frog legs make him pretty dog-gone cute. 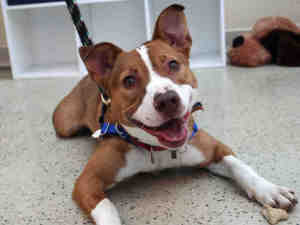 Benjamin is a red and white Australian Cattle Dog and Pit Bull Terrier mixed breed dog. At about 11 months old, he's still got lots of that puppy energy and ready for some fun. He's neutered, walks nicely on a leash, and sits for treats. A big lover, he's crazy about people and not at all happy being confined to his cage at the animal shelter. In fact, Benjamin has been at the HSMO St Louis City animal shelter since March 2012 and he needs a place to call home very soon. If you have room in your heart and in your home, make a call to 314-951-1562 and find out more about Benjamin A526612. Awwwe....he's a sweety! Keeping paws crossed that he finds a forever home really soon! I got my paws crossed for ya!